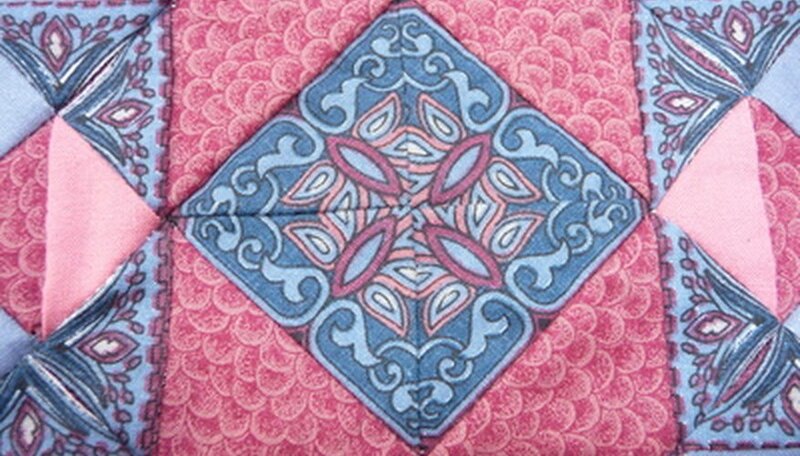 Many quilters are discovering the benefits of backing a quilt in soft fleece fabric. When you use polar fleece to back a quilt, you do not need to add a layer of batting between the quilt top and the quilt backing because the fleece acts as both the batting and the backing layers. Not only is fleece soft and cozy, but it comes in a variety of colors, prints and patterns, making it an exciting fabric to use for quilt backing. Lay the finished quilt top out onto a flat work surface (such as a clean floor). Smooth the quilt top so it is flat and wrinkle-free. Measure each side of the quilt top with the tape measure, add 1.5 inches to each measurement and write down the measurements. Spread out the polar fleece fabric and measure the dimensions you wrote down in Step 1 onto the polar fleece using the tape measure and a fabric pen. Cut out the polar fleece along the measuring lines. Lay out the polar fleece backing with the right side of the fleece facing down. Place the quilt top over the polar fleece with the right side facing up. Smooth the layers of fabric to remove all wrinkles and center the quilt top in the exact center of the polar fleece backing (the polar fleece backing will be 1.5 inches larger than the quilt top on all sides). Place the basting safety pins into the layers of fabric to hold them in place. Starting in the center of the quilt, insert pins through both the quilt top and the fleece. Space the basting pins every 2 to 3 inches, working your way out to the edges from the center until you pin-baste the entire quilt. Quilt the layers of fabric together with the sewing machine. A simple and fast quilting method is to “stitch in the ditch.” This technique involves sewing along some or all of the seams you made as you pieced the quilt top together, making your quilting lines approximately 1/4 inch away from the seams. Stitch as much or as little quilting as you like, removing the basting pins as you come to them. Do not extend your quilting stitches onto the excess fleece fabric around the edges of the quilt top. Fold up the excess polar fleece around the edges of the quilt top so the polar fleece creates a bound edge around the quilt. The raw edge of the fleece will lie upon the top outer edge of the quilt top. Pin the folded fleece in place around each edge, folding the corners in neatly. Stitch around the raw edge of the fleece using a wide zigzag stitch to secure the fleece binding around the edges of the quilt. Take care not to stretch the fleece out of shape as you pin the layers together and quilt the layers.